Do you know what Search By PrsstMusic is? Search By PrsstMusic is a potentially unwanted program (PUP) that ought to change Google Chrome’s default search engine to blpsearch.com. While using the mentioned search engine, you might get redirected to a modified Yahoo search version and the results it displays could show various advertisements coming from unknown sources. If you have no idea how this extension ended up on your browser and do not like the changes it might have made, you could delete it while following the removal guide placed below or with a reputable antimalware tool of your choice. On the other hand, if you wish to learn more about Search By PrsstMusic before deciding what to do with it, we invite you to read our report first. In it, we will discuss the extension’s working manner, its possible distribution channels, and how to stay away from PUPs. Lots of PUPs are spread through pop-up ads and bundled software installers. Our researchers say it is entirely possible that Search By PrsstMusic could be spread through these channels too. However, we do not think the extension is widely distributed or popular yet since at the moment of writing Chrome Web Store page says it has only 19 users. If you do not want such applications on your system, you should be more careful when installing new tools. Even places like the Chrome Web Store page can contain PUPs, so it is up to you to research the plugins it provides and determine whether they are worthy of your trust. Once Search By PrsstMusic gets installed the extension should change users default search engine with blpsearch.com. The fact the results might be displayed with Yahoo could seem confusing. You should know that the Yahoo you might be seeing after being redirected to it by blpsearch.com could be modified. Modified version may allow the PUP to place additional advertising content among the gathered results. Meaning, they could be a bit different from the results you would get while using the original yahoo search engine. If the application shows any ads, keep in mind they could come from various third parties, and so there is a chance some of them could be unreliable. For this reason, we would recommend being cautious when using Search By PrsstMusic search engine. If you decide you do not want Search By PrsstMusic on your browser, we can explain to you how to get rid of it. The first option is to go to Google Chrome’s extensions menu and remove the unwanted extension from there. The process is explained step by step in the removal guide placed below, so if you need any guidance, feel free to use it. Users who do not mind installing antimalware software could pick a reputable tool of their choice and perform a system scan instead. Press Enter and search for Search By PrsstMusic. 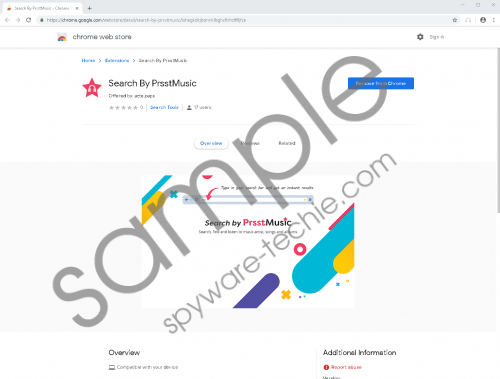 Search By PrsstMusic is one of those PUPs that promise access to particular content right from the user’s browser or address bar. In this case, the application offers a search engine for music lovers that allows searching for music from the user’s address bar. Nonetheless, the extension may also change the user’s default search engine. Some users might not like the idea the application could show third-party advertising content coming from unknown sources together with the displayed search results. If you were happy with your previously used search engine, you could go back to it after you erase this PUP. To get rid of it manually you should follow the instructions available a bit above this paragraph. It can be deleted with an antimalware tool too, so if you prefer using automatic features, all you need to do is pick a reputable tool you can trust. Also, if you have any questions about the deletion process or the extension, you can write us a message at the end of this page. Tags: delete Search By PrsstMusic, remove Search By PrsstMusic, Search By PrsstMusic.